Cycling today on some back roads. We went through palm plantations on gravel roads and it felt like we were in the middle of nowhere. We had a long stretch of no villages so we were in need of a rest stop but there was no good place other than the side of the road. We decided that we would stop at the first place we came to. Eventually we reached a little food stall on the side of a road. It seemed to be run by an Indian guy. He did not speak any English so he made one of his other customers, who spoke English, serve us. We had ice tea and the best curry puffs I have ever had. They were perfect. Tasty but not too hot. 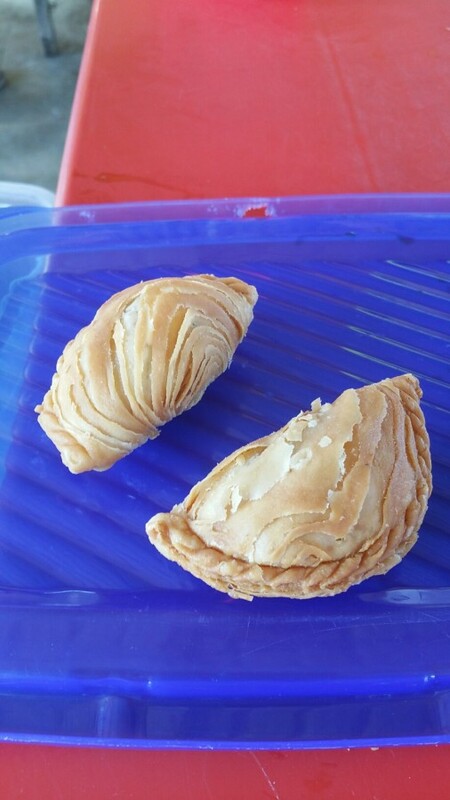 The filling was a really nice texture and the pastry was amazing. He only had 6 and we eat them all. The other customers were laughing at us. I can only assume they were laughing because we demolished his supply of curry puffs in about 5 minutes flat. Hi. Your helmet straps look pretty loose in Allister’s photos. Ran into Jock at the Denmark markets today. Having dinner with them tomorrow night. Stay safe. Love from Susan. Hope you got the recipe.